Troy Alves continued his dream run up the ladder of bodybuilding fame and fortune by gaining a place in this year’s Olympia, coming in second to Chris Cormier. Troy Alves continued his dream run up the ladder of bodybuilding fame and fortune by gaining a place in this year’s Olympia, coming in second to Chris Cormier. This qualified him for his first ever Mr Olympia appearance. Popular Australian Jonathan Davie also became an Olympian contender placing third, edging out a very unfortunate Claude Groulx. This DVD includes the complete prejudging – including the solo compulsory posing by all the guys. At the evening FINALS you see all the exciting posing routines, posedown and awards. 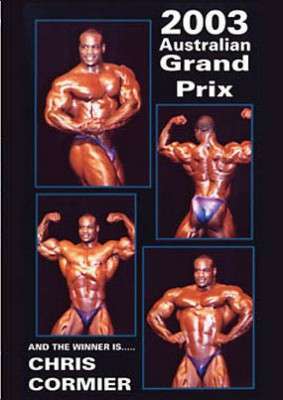 Also includes an emotional speech from Flex Wheeler (read by Wayne DeMilia) announcing his official retirement due to ill-health. Flex Wheeler was one of the greatest bodybuilders of all time and was incredibly unlucky not to have won an Olympia title. He holds the Arnold record with 4 Arnold Classic victories and won countless Grand Prix in his illustrious career.